We take pride in our work & total customer satisfaction is one of our key objectives. We ask all our customers to complete a short satisfaction questionnaire after any work is carried out. The results are then logged and analysed to ensure we are maintaining the high standards we set ourselves. Some Recent Work from Samsian Ltd can be seen below. This invaluable feedback is public on the Checkatrade website under our own page. 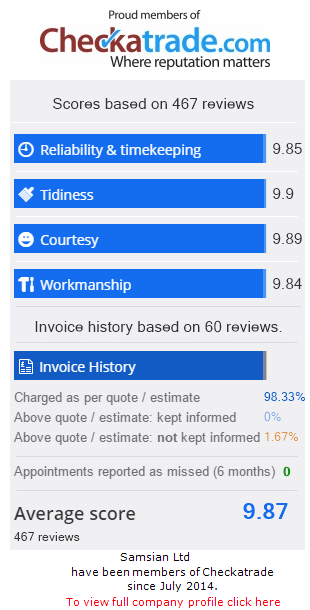 The feedback that Checkatrade receive from our customers is verified by telephone and or email to ensure its genuine. We also publish the feedback on our website with the customer’s permission & below is a small selection of related boiler installations we have carried out recently. We really do give the best possible service every time so if you are looking to upgrade your central heating system, install a new boiler, replace your conventional boiler for a new condensing boiler, upgrade an old conventional boiler to a condensing combination boiler system with instant hot water on demand or just need some free unbiased friendly advice, give us a call or fill out our contact form and put us to the test. Samsian Ltd provide the solutions you are looking for.